The orphanage in which Kay and Roan live burns down and they must find a new situation. They decide to travel to the School of Faith to train to become one of the highly esteemed Razors. They’ve pledged to stay together but will they make the tough choices to survive? The author, Joe King, gave me a copy of this novella in exchange for my review. 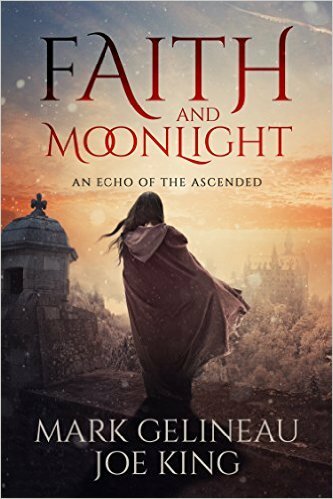 “Moonlight and Faith” is a fantasy genre novella. Standing at 91 pages it’s a short read but satisfying. The School of Faith mixes folklore of learning to harness the power of the ancestors and the fantasy of mysticism. The structure of the school is wonderfully complex and fascinating. While dealing with some fairly heavy subjects, “Moonlight and Faith” is reminiscent of Terry Pratchett in that laced through the heavy atmosphere; array of emotion and implausible magic is hope. That spirit of what might be lightens the feel considerable making for a delightful story. Roan and Kay have been the family chosen and they pledge to stay together. There are times that a deep division exists between what we want and what we can have. They have one month to prove they belong at the school and the criteria is harrowing. Roan and Kay have a dependant relationship in which they protect each other but tough decisions may divide them. Do they have the inner strength to weather a possibility of having to walk different paths? The Razors are elite and not everyone is suited to join their ranks. King and Gelineau have teamed up for three other books and have perfected their partnership in “Moonlight and Faith”. There is not the feel of a dual author book. The characters and setting are pretty seamless and fit perfectly. Roan and Kay don’t know what they don’t know and the audience just stepping into the world learns that not all at the School of Faith is heroic glory. They run the gamut of emotions from disappointment to disenchantment to heartbreak and all in handled with a tasteful simplicity. The characters are well thought out and distinctly plotted. They are well matched as a team but also work well apart. There is an implied connection that is illustrated in the story and believable. The best thing about Roan and Kay is that readers will leave the book wanting to know more and the promise of a continued series could not be clearer. If you’re looking for something new, fresh and captivating for your young adult or teen to read over the holiday break, pick “Moonlight and Faith” up today. I plan to load it to Alex’s Kindle to read on our trip away. It is fantasy, adventure and a rich landscape that will expand your child and delight you, should you also choose to indulge. For more information about Joe King and Mark Gelineau and their work, visit their website.